Despite the fact that winter’s here at Grow Heathrow we’ve done away with the boring traditions of hibernating and waiting for spring to come along. No, instead we’ve been busy planning our next big season of workshops and events following on from the successes of Autumn Shazzam. And we’ve got a great birthday party lined up for the end of Feb. our fifth! 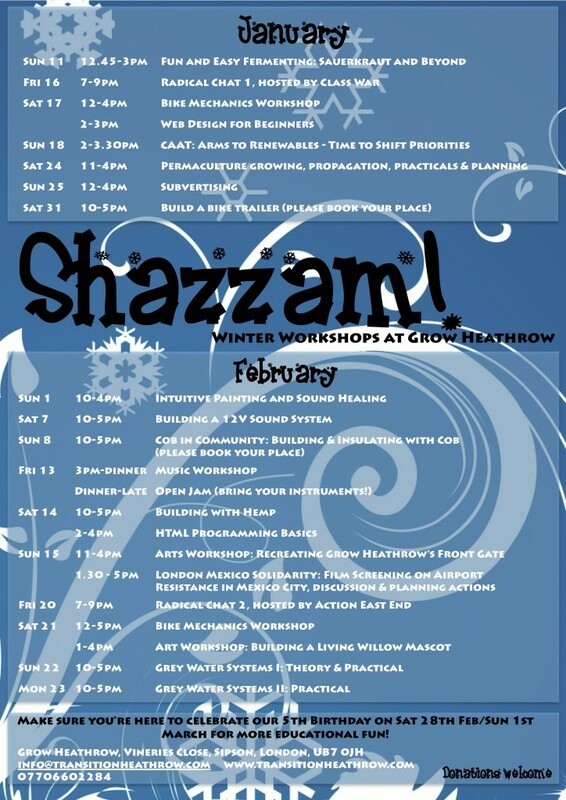 Come along to Grow Heathrow for Winter Shazzam – a jam packed 2-month programme of 20 workshops and events – from theoretical discussions to getting your hands dirty and putting things into practice (see the full list of events below). Whilst most events don’t have a limited amount of space, some do, so be sure to book your places (by emailing info@transitionheathrow.com) and for the others feel free to let us know you’re planning to come so we have an idea of numbers. All the events are on a give-what-you-can donation basis, which helps us cover any of the basic costs. and everyone is invited to the birthday party on the weekend of the 28th of Feb.
We look forward to seeing you here and if the cold does come – we’ll be sure to have the kettle on ready!